Yahoo has announced that Jerry Yang, one of the origional Co-Founders of Yahoo over 17 years ago has resigned from Yahoo’s board of directors. Yahoo recently appointed a new CEO, Scott Thompson who was previously President of Paypal. 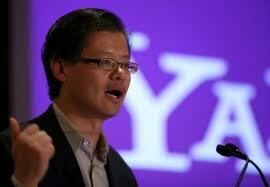 Jerry Yang co-founded Yahoo in 1994 with Stanford friend David Filo. According to Alexa.com Yahoo is the 4th most popular website in the world, and has a large market share in display advertising.